(Wash. DC) An amazing political and social event is under way in three critical swing states. Virginia and North Carolina show a major shift by white voters benefiting Sen. Barack Obama. Florida whites are also moving but at a somewhat slower rate. The total number of white votes shifting from McCain to Obama is around 900,000 currently. That number will vary depending on turnout and campaign events. The exact size of the vote shift is important but it's not nearly as significant as the "white shift" phenomena. This "white shift" is the topic of a just released survey by Public Policy Polling of Raleigh North Carolina. The decades-long pattern in Southern presidential contests consisted of heavy white support for the Republican presidential candidate consistently defeating the remainder of white voters plus the 90% support by black citizens consistently voting for Democrats. For the first time in decades, there are signs of cracks in Richard Nixon's Southern Strategy. This divisive approach may soon be put to rest where it belongs, in the dust bin of history. It's a clear indication that a "White Shift" is taking place right now in these three critical swing states. White voters are indeed moving to Sen. Obama. The chart below shows some of the results from the survey demonstrating the change. The dramatic shift in projected 2008 white voting is evident for each state. 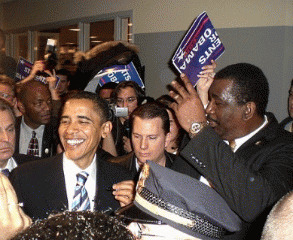 It demonstrates the potential for a strong 2008 "White Shift" to Sen. Obama. 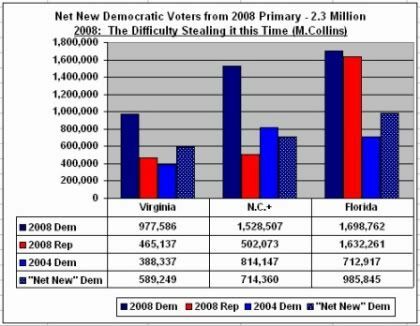 The "white shift" adds election protection provided by the critical category of voters discussed previously in "Scoop" Independent News, "net new" Democratic primary voters: Michael Collins: Election 2008 - The Difficulty Stealing It This Time. The chart below shows 2004 and 2008 Democratic Party turnout plus 2008 Republican primary turnout for the three states surveyed by Public Policy Polling. "Net new" primary voters are those voters who represent the difference between 2004 and 2008 Democratic turnout. + North Carolina ("NC+") above did not have a 2004 presidential primary. The figure used for "2004 Dem - N.C." is an estimate.